The Raspberry, Limoncello and Prosecco Cooler is a cocktail made with a combination of Italian ingredients. The Prosecco and Limoncello create a true delight for all the senses. The addition of rasberries and fresh mint garnish make for a truly pretty drink with a beautiful array of colors – deep pink, green and yellow. The colors scream out “summer!“, making this perfect for a gathering on a warm evening. It’s a light beverage, both in flavor and in calories. If you feel like pushing the boat out, use champagne instead of Prosecco for an even more decadent feel. Put your glasses in the freezer if possible, or at least the fridge so that they are cold. Put the raspberries on a plate; separated from each other and place in the freezer at least 15 minutes before serving time. 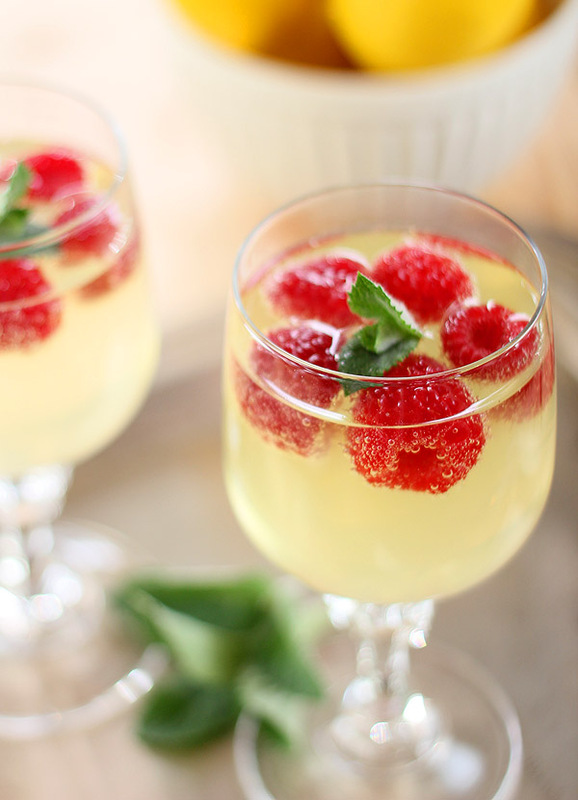 Gently 'smush' a couple of small mint leaves and add to each glass along with 5-6 of the frozen raspberry ice cubes. Add limoncello, then the sparkling wine or water.